This is a story about community, a perfect storm of social media, people, and the gathering of like minded souls that ended up conquering a mountain. Today we’re going to Andreea about the journey from Tweet to mountain top, how ideas start and how you turn them into a reality. We’ll also dip into Tracy Keogh from BDO’s mind on my she wanted to get involved in Startup Hiking and what she’s learned. A lot of people in the community will have heard of Andreea Wade, as well as mentoring at all of Dublins top accelerators NDRC / UStart DCU, DSA (Digital Skills Academy) and mentors a lot of the Wayra startups she also had time to found a strategy led digital agency called Brandalism. 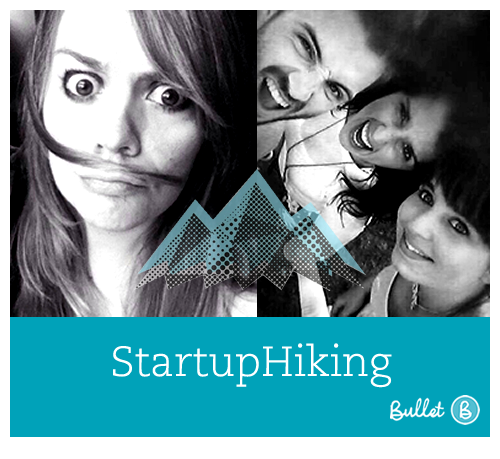 You can follow Andreea @brandalisms, Tracy @Tracy_Keogh don’t forget @startuphiking, and find out about the hiking meetups on their Startup Hiking Meetup Page. I want to go hiking. Do you also want to go hiking? Because I really want to go hiking. So, Andreea you’re pretty involved in lots of community events, what was the motivation behind creating another one? Andreea: I wanted to go hiking. 🙂 I posted a tweet and asked who else wants to go. A few people from the startup community replied. My next thought was ‘’Oh. Hiking. With startup people. Startup Hiking! !’’ It only took me a few minutes. I get all sorts of ideas and I tend to act on them. I didn’t necessarily think of it as ‘’another event’’, it was more like ‘’another thing people want to do’’. Or should do. We need to do more stuff, us, people. Out there. Especially us, the tech startup community people, forever glued to our devices. Wifi, the digital caffeine for most startups and mast free mountains isn’t the first environment you’d expect Startup people to hang out. Is ‘no reception’, part of your plan? Andreea: Why not? Disconnect to connect. With nature, you know… the wind, the rain (hopefully not) and with each other. Walking is good for creativity, being out and about will hopefully get us all thinking and engaging with that which surrounds us… not with what is afar, in some digital space. We can reserve that for the evening, when we go back home and take to Twitter to share photos. Tracy, you’ve been involved in a startup before joining BDO. What was your motivation to get involved in this community meetup as opposed to others? Tracy: Firstly, I wanted to work with Andreea – I have learnt so much from her already! Second, I joined BDOFit with people from all over the firm who train once a week and compete (Kind of, we turn up anyway!) in triathlons. It’s been really good for building relationships. Meeting people outside of the office & getting the heart pumping is really good way to get the ideas flowing! Andreea, you’re very involved in the tech community. What advice would you give to others looking to build an event? Andreea: I have been organising events for a long time. I used to organise outdoor fests. Nobody taught me how and I didn’t study event organising either. Walk through the event. This is what I do. Before organising it. Visualise the venue/meeting place, people arriving. Think of all their needs, think of all the possible scenarios that can happen with regards to… everything. Is the entrance visible? Will people get lost in the building? Will people be hungry? Is there anything that would raise comfort levels? What could create confusion and how can you eliminate that possibility? Will people be happy? What could you do to make them smile? Do the same exercise with all those involved: the venue, the speakers, the catering company, the volunteers, the sponsors or partners and so on. But this assumes that you have a concept. Before looking to build something, you must answer this one question: ‘’why?’’. Find out what the answer to that is and start framing your story. Then start imagining. See the people coming your way? Are they smiling? Try and keep that smile on their face. And another important thing: need help? Ask for help! Talk to the other organisers within the community. Oh and by the way, I met Tracy at one of these events (I co-organised Startup Weekend Dublin this year and Tracy was one of the participants – she ended up winning Best Pitch). Do stuff, act on your ideas, treat others as you would like to be treated and you will have nothing to lose and much to gain. Are there any great plans for Startup Hiking or is the great plan to keep it niche? Andreea: Since last week I’ve heard of 4 people (some very engaged in the community) who wanted to organise something similar to this. We are meeting some of them soon. But the difference between wanting, talking and doing, in this case… it’s @StartupHiking. ‘’It’s alive’’! Do I want something bigger? Do *we* want something bigger… as it’s three of us now, myself, Tracy and @Aisling too (@aislinghannon). I had this thought about… Transylvania. Who knows… Maybe next year. Ultimately, Startup Hiking is about clearing our heads – not about creating more work for ourselves. What community event would you like to start?